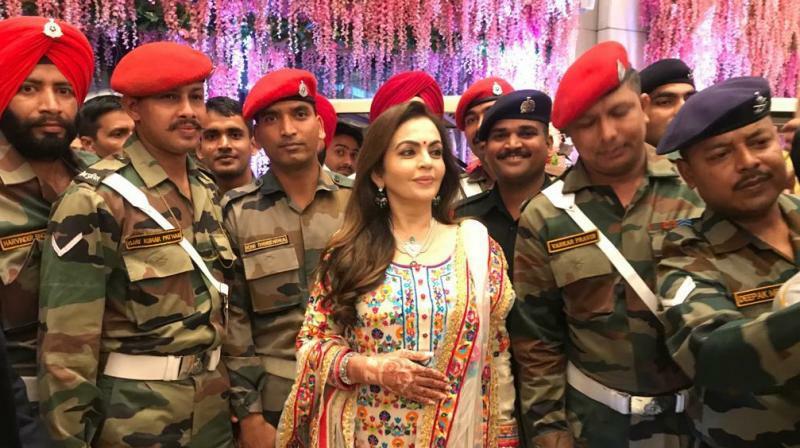 Mumbai: As an expression of gratitude and respect for the people who make the city and nation safe, and to seek their blessings for their son Akash’s wedding with Shloka, Nita and Mukesh Ambani today celebrated with thousands of members of Army, Navy, Paramilitary Forces, Mumbai Police, Railway Protection Force and their families. The highlight of the celebrations was a special Musical Fountain show called Ananta Prem at the Dhirubhai Ambani Square which is conceptualised by Nita Ambani set on the theme of Krishna’s Raas Lila to symbolise an eternal love story. The celebrations were held at the newly opened Dhirubhai Ambani Square in Mumbai’s BKC district, which is dedicated to the city of Mumbai.